Boats in a flooded marina parking lot await spring launch in Sodus Bay, New York. With Great Lakes water levels on the rise and expected to continue to increase into summer, recreational boaters could find that deeper water under the keel may open a whole new range of cruising, fishing or sailing grounds to navigation. That same deep water, however, may present unique safety concerns on the water and at the dock, says Boat Owners Association of The United States (BoatUS), the nation’s largest advocacy, services and safety organization. 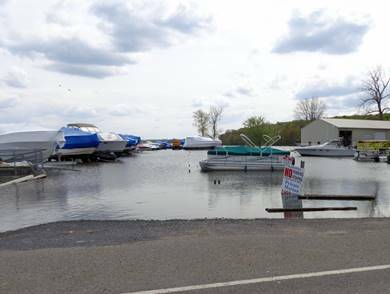 According to the US Army Corps of Engineers, Lake Ontario is expected to see the largest increase at 17 inches higher over last year and lowland flooding is already hampering the boat-launch season on the lake. The second largest year-over-year increase goes to Lake Superior at 12 inches higher sometime in August, while Lake Huron and Lake Michigan are both predicted to rise 8 inches. Lake Erie is expected to be up 5 inches over last year. On the water: The good news is that deeper draft vessels may have more options for mooring, anchoring and slip rental, as well as increased access to the water. However, high water shifts sandbars. Traveling at slower speed can reduce the risk of grounding or running gear damage. 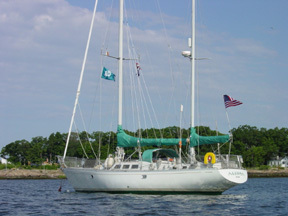 Transient boaters can contact local TowBoatUS operators on VHF channel 16 for local information. In you’re headed into unfamiliar waters post an extra lookout, and if you’re traveling far, check ahead as locations to tie up may be inaccessible. On the dock: Many fixed (non-floating), boat docks with electrical service are submerged, potentially compromising wiring and electrical connections. When waters recede and before power gets turned on, inspect the electrical service and consider installing a ground fault protection device if your dock power system does not already have one. Without it, the risk of Electric Shock Drowning (ESD) increases. A dock electrical maintenance check-up is also a good idea to schedule at the beginning of the each season.